Every February, not only in this country, but in many countries around the world, candy, flowers and gifts of all kinds are given in the name of love. This is because many years ago someone, in the name of love, it is rumored, did that same thing. It seems that the origin of St. Valentine’s Day is shrouded in a little bit of mystery. What we do know is that this day contains vestiges of both Christian and ancient Roman tradition. Today, the Roman Catholic Church does recognize different saints named Valentine or Valentinus, all of whom were martyred. Each of their stories honored these men with feasts on February 14. Over time their stories were all combined into one story about St. Valentine. The story which evolved was about a Roman Catholic priest, bishop of Interamma, who lived during the third century under the reign of Emperor Claudius II. During his reign, Claudius was involved in many wars. Recognizing his need for young men to serve in his army, Claudius forbade men to marry. The reason for this was the fact that the men would refuse to join the army because of being married. Valentine thought this to be totally unfair and he began to secretly marry couples in spite of the emperor’s orders. When Valentine was found out, he was arrested, placed in prison and sentenced to die. During his imprisonment he wrote letters to those of his parish and signed them “From your valentine.” Is this not being carried on today – sending cards on Valentine’s Day? Lupercalia was known in Roman mythology as an ancient Roman fertility rite called the Feast of Lupercus, which was celebrated on February 15 and named after the Roman god Lupercus who was to protect flocks from being attacked by wolves at night. What else is associated with wolves in Roman mythology? 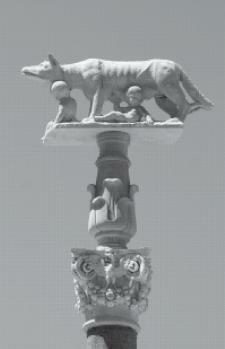 Lupercalia is also a celebration to honor the mythical founders of Rome, Romulus and Remu, who were supposedly suckled by the wolf Lupa in a cave named Lupercal. Further, in this celebration of Lupercalia, the priests (called Luperci), dressed in goatskins, would sacrifice a goat (a symbol of fertility) and a dog (a symbol of protection), anoint themselves with the blood of the sacrifices and then run through the streets whipping onlookers with a thong made from the goat’s skin. Women would desire to be whipped with these goatskins because it meant fertility and easy childbirth. Interestingly enough, these thongs were called februa and the lashing the februatio, both stemming from a Latin word Februarius (February) meaning to purify through sacrificial offerings. Another part of this Lupercalia celebration was to honor Juno, the Roman goddess of women and marriage (somewhat connected with what St. Valentine did which caused imprisonment for him), and Faunus (associated with Pan), the god of nature. In this part of the annual celebration women would put their names in a box and teenage men would draw a name and the two of them would be paired up for one year until next year’s celebration of Lupercalia. Over time this lost favor with the populace and young men began a custom of offering women they admired and wished to court handwritten greetings of affection on February 14. Thus began the idea of Valentine’s Day cards. Faun (Faunus) is defined as a class of rural deities represented as men with ears, horns, tail, and later also with the hind legs of a goat. All these are nice stories! Even so, they are examples of the ongoing efforts of religious leaders of the Christian church to appease their members and new converts through syncretism. 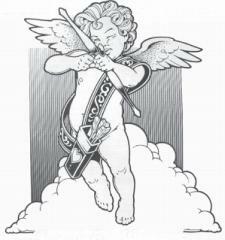 By definition, syncretism is “a combination, reconciliation or coalescence of varying, often mutually opposed beliefs, principles of practices into the new conglomerate whole typically marked by internal inconsistencies.” Most people today could remember the story of St. Valentine, but not so with the different celebrations noted here. Mostly, mythological stories are soon forgotten. He was a mighty hunter before Yahweh; wherefore it is said, even as Nimrod the mighty hunter before Yahweh. The hunter, Nimrod, it is said, pursued wolves in the Apennine Mountains of Italy, and acquired the title of Lupercus – wolf hunter or hunter of valor. Remember, the word valens means to be strong, powerful, mighty. Nimrod, the Baal-Lord-Sun God of the ancients, is the basis for all mythology worldwide. His exploits are well noted in a book entitled “The Two Babylons” by Alexander Hislop. The symbols associated with Valentine’s Day are not simple and meaningless. In Greek he is called Eros, the god of love, and son of Aphrodite, the goddess of love and beauty. Cupid has always played a role in the celebrations of love and lovers, including those of a mischievous, naked, winged child carrying a bow and a quiver of arrows. Because of this visionary picture he is sometimes regarded as taking aim with his gold-tipped shafts at the heart of mankind. When Yahweh thy Elohim shall cut off the nations from before thee, whither thou goest to possess them, and thou succeedest them, and dwellest in their land; Take heed to thyself that thou be not snared by following them, after that they be destroyed from before thee; and that thou inquire not after their idols, saying, How did these nations serve their idols? even so will I do likewise. Thou shalt not do so unto Yahweh thy Elohim: for every abomination to Yahweh, which he hateth, have they done unto their idols; for even their sons and their daughters they have burnt in the fire to their idols. What thing soever I command you, observe to do it: thou shalt not add thereto, nor diminish from it. What does Yahweh say about the leaders who lead people to follow such pagan beliefs? For such are false apostles, deceitful workers, transforming themselves into the apostles of Messiah. And no marvel; for Satan himself is transformed into an angel of light. Therefore it is no great thing if his ministers also be transformed as the ministers of righteousness; whose end shall be according to their works, 2 Cor 11:13-15. Besides North American countries celebrating Valentine’s Day, one can easily go on the internet and find out how this day is celebrated in many countries in Europe, Asia, South America, etc. And I heard another voice from heaven, saying, Come out of her, my people, that ye be not partakers of her sins, and that ye receive not of her plagues, Rev 18:4. Once one has decided not to participate in this world’s holiday celebrations, but to learn and keep Yahweh’s Sabbaths, a feeling of accomplishment will definitely be felt and a desire to do His Will will lighten one’s burden.